I have always 'talked' a good tattoo but have never had the courage to actually book one myself. It is something that was on my 'before 30 list' but the best I did was a henna motif on my ankle, last July in Ibiza. Wuss. My bestie, Sami, has lots of them and they really suit her. I am going to be Maid of Honour for her in August. We have also been friends coming up for 18 years now. We were best friends all through school and we got up to some mischief. To celebrate this and as a Maid of Honour present, Sami suggested we get a matching tattoo. I thought that this was an amazing idea, what a unique gift to someone. I wasn't completely certain anything would come of it but she called a fortnight ago and said 'that's us booked in, you can't chicken out - i've paid the deposit!'. Yikes I thought! 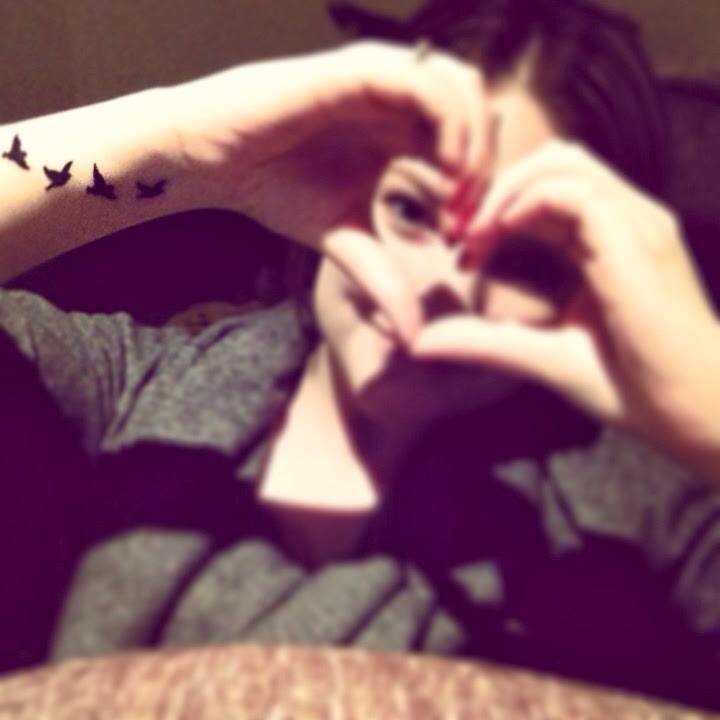 Originally we were going to get a tiny heart on the wrist, however, I have always loved tiny bird tattoos, I thought they were really pretty, so the night before, thought I would chance my luck and suggest a change of design. Surprisingly, I didn't have to try hard at all. On Tuesday morning, after a couple of cans of Red Bull to psych me up. Sami drove us to a shop called 'Draconian', who are well renowned in Aberdeen for their great artistry. I have to say I was very nervous, hands were clammy and my legs felt like jelly when I went through. Sam went first as she's done it often and it did put me at ease watching someone else go first. Next up my turn, sudden feeling of dread but the guy put me at ease, 'you've given birth twice, you can do this'. You know what, it wasn't so bad at all. I got four lovely little birds in flight twisting round the arm up to the wrist and I absolutely love it. 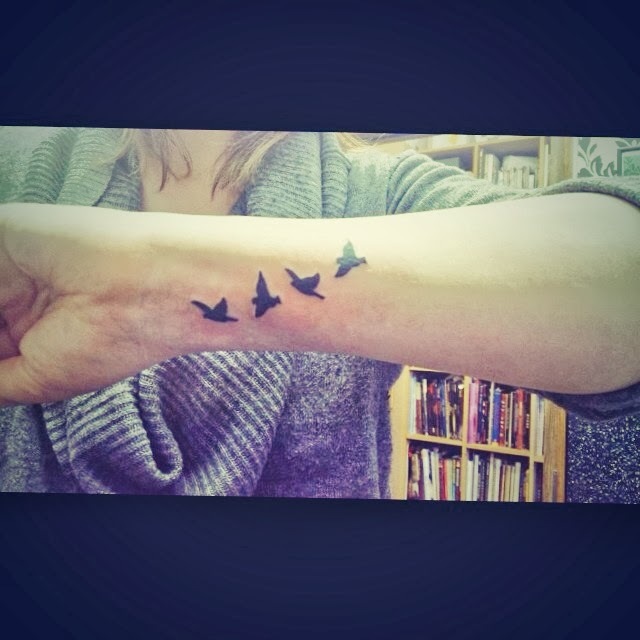 The birds represent my little family, the four of us flying together through life. Admittedly, the bird nearest the wrist was a little scratchy but the others were completely fine. I can see how people get addicted to getting them. On Tuesday night I started to feel a bit feverish and nauseous, I think I must have had some sort of body shock, adrenaline come down - have any of you experienced this? My younger sister wasn't impressed with me, we'd always said we would go for our first tattoos together. We do plan to get one later in the year as a tribute to our brother who would be turning 30 in December. I will need to think long and hard about that one, very difficult as I want it to be relevant and fitting - needs to be perfect. I really like the infinity signs. Watch this space. What do you think of my little birds? Do you like tattoos? I have already had a mixed response. I've even had some rude comments. I don't expect it to be for everyone but I really live by the rule if you can't say something nice, don't say anything at all. Wow, that is so cute, I love tattoo's!, I only have one as the Hubby isn't a fan, but I would love to have something similar to what you have. Enjoy being Matron of Honour. I think that is a really lovely tattoo :) I can't make my mind up on them myself, they can look great on other people but on me I don't know if they would. Such a lovely tattoo and i like the placement too, i love tattoos and only have one but have been itching to get aother! Yeah and cause it sort of twists round you can only really see it from the left of me unless i turn my arm over. Really love this - so pretty - and it makes me want to get another tattoo immediately! Aw thanks Laura, do it!! I love love love it!! I have seven of these birds on my left foot smaller to bigger and I love it! Obviously it won't be everyones taste but it is so rude of them to have said mean things about it because it is beautiful, and has so much meaning to you! :) I can't wait to see your next one! I love yours! To me, it's the meaning behind it that matters most. I don't get why people complain. I mean it's your body and money, right? I have 3 tattoos and MANY more planned. Don't feel bad about changing your mind as once it's on, it's hard to change. I was planning my first for about 10 years before I got it done. They are very addictive, too. Love the bird tattoo! Simple yet elegant! Woah! That is so gorgeous!! I love the tattoo and think it is such a nice idea that you did it together! Tattoo snobs really annoy me, just ignore them, haters gonna hate and at the end of the day everyone has different tastes! 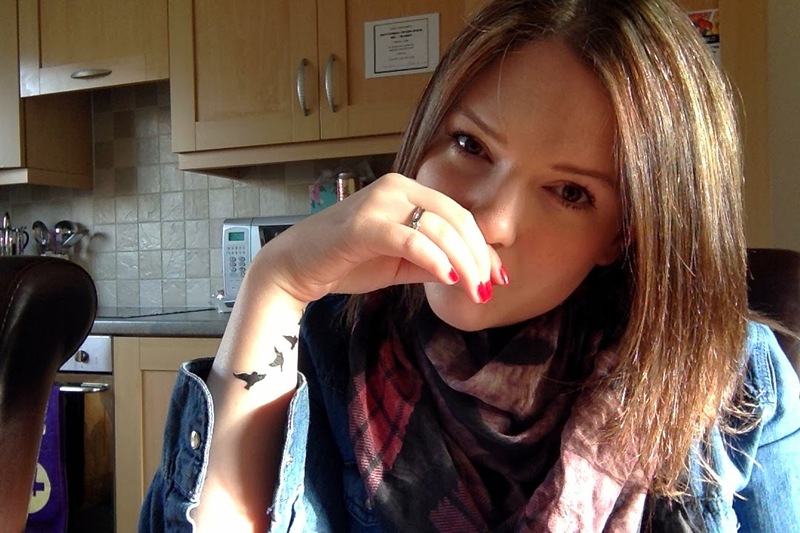 Love the tattoo, and love your new blog design! Gorgeous tattoo, I love tattoos on wrists. I have stars down my back! Would love to get a tattoo like that!